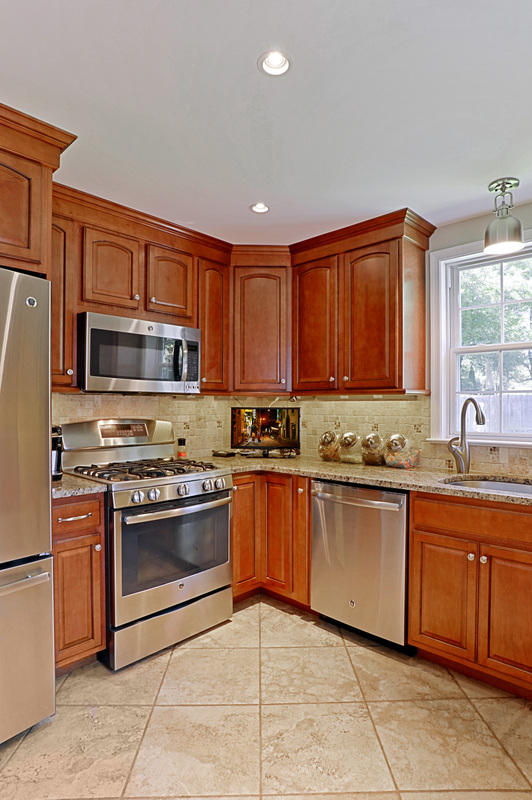 When you walk into a kitchen, what catches your eye? Cabinets? Counter tops? What about the floor? 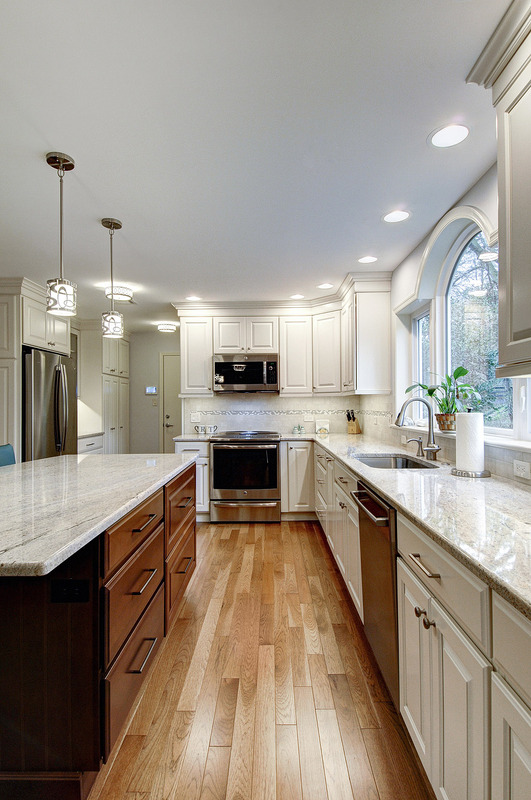 If you’re considering updating your kitchen, the kitchen flooring you select is a major decision. 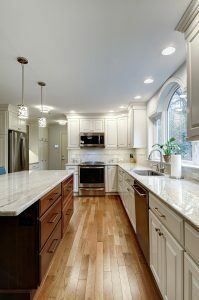 You want your kitchen floor to be low maintenance and one that can stand up to a wide range of spills like water, food and even dropped dishes. If you like eco-friendly products, bamboo is a great kitchen flooring material. Bamboo is one of the strongest of the natural materials on the market. The Positive: Durable, beautifully grained, eco-friendly. The Drawbacks: Some bamboo flooring can dent easily. 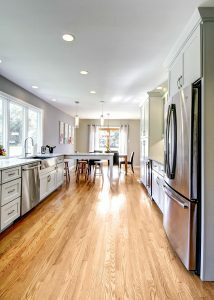 Laminate flooring is an affordable and durable kitchen flooring idea. The top layer can withstand most abuse, and if you add padding beneath, you have a soft, ergonomic floor. The Positive: Durable, cost effective, wide variety of options. The Drawbacks: May be slippery, noisy, cannot refinish. Because of the variations in pattern and color, stone gives your kitchen flooring a unique, earthy look. Stone flooring is naturally cool, which is perfect in hotter zones. The Positive: Hard, durable surface, easy to clean. The Drawbacks: Certain stones may stain, requires routine sealing, some fragile stones like slate may chip easily. 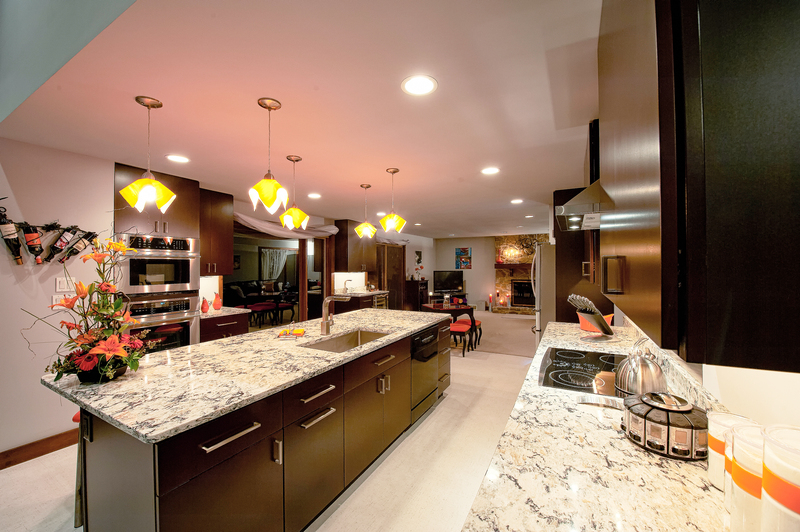 Tile is a great, low-maintenance solution for a kitchen. It’s easy to clean, durable and has a reflective quality that expands the appearance of space in a kitchen. The Positive: Durable, moisture resistant, easy to maintain, available in a large assortment of styles, shapes and colors. The Drawbacks: Grout lines may be difficult to keep clean, dropped items like glassware and dishes will likely shatter. Vinyl is affordable, comes in a variety of textures and styles and is one of the most water-resistant kitchen flooring options. The Positive: Water resistant, certain styles look just like wood. The Drawbacks: requires a flawless subfloor to install on, can gouge easily. Wood has a high-end, warm look that’s unique according to grain and age. But wood in the kitchen requires special protection from excess moisture. The Positive: Adds resale value, attractive, durable, can be refinished. The Drawbacks: Can be noisy, needs periodic refinishing, may dent or scratch easily. Whatever the material you decide to use, we can help. Call us for a free consultation with one of our professionals.